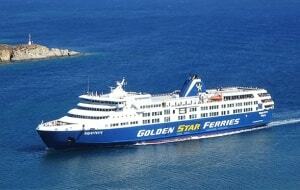 GOLDEN STAR FERRIES - Daily routes from Golden Star Ferries for Thessaloniki- Skiathos- Skopelos- Alonissos- Volos. Daily routes from Golden Star Ferries for Thessaloniki- Skiathos- Skopelos- Alonissos- Volos with highspeed vessels Superspeed and Supercat. GOLDEN STAR FERRIES offers a 30% discount at the military personel , soldiers and members of the Security Forces, for single tickets and their vehicles. 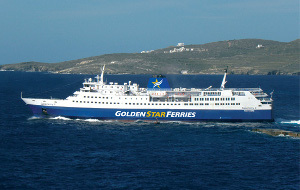 GOLDEN STAR FERRIES - Superunner vessel of GOLDEN STAR FERRIES will serve from the port of Rafina the ports of Tinos, Mykonos, Paros, Naxos, Ios and Santorini. GOLDEN STAR FERRIES is pleased to announce that for the period 26/04 – 01/10/2017, the new vessel, high speed SUPERRUNNER will serve with daily departures from the port of Rafina, the Cyclades islands Tinos, Mykonos, Paros, Naxos, Ios and Santorini. 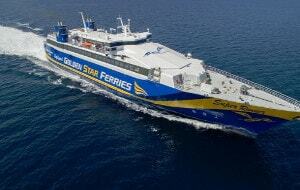 GOLDEN STAR FERRIES - Morning itineraries from Rafina with SUPERFERRY of GOLDEN STAR FERRIES. GOLDEN STAR FERRIES announces the beginning of the itinerary of the vessel SUPERFERRY from 07/07/2016 with daily departures from Rafina at 07:50 to Andros, Tinos and Mikonos. Every afternoon from Rafina at 16:50 to Andros, Tinos, Mikonos, Naxos and Paros. Η εταιρεία ανακοινώνει ότι κατόπιν η έκπτωση 30% στα εισιτήρια επιβατών και οχημάτων στα αυθημερόν ταξίδια εξακολουθεί να ισχύει και για τους μήνες Ιούλιο και Αύγουστο.